Stir ingredients with ice in a shaker and strain into a chilled glass. Garnish. 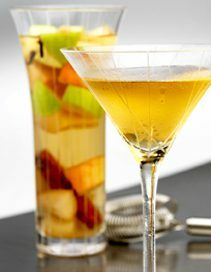 Pear-Infused Tequila: Cut 3 Bartlett pears and 1 Granny Smith apple into cubes (peels, cores and all), and place in a jar. Add 2 cloves and 1 cinnamon stick and 1 liter of silver tequila. Store for 6 days, shaking periodically. Double-strain the fruit and spices out and keep refrigerated.